Providing you the best range of calcium silicate insulation- csgold, calcium silicate blocks/pipe insulation and lubricant oil with effective & timely delivery. 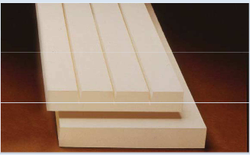 CSGold blocks are inorganic, non-combustible; high temperature insulation tailored for systems operating up to 1000°c, and is composed primarily of hydrous calcium silicate. It comes in three colour variants like White, Grey and Light Yellow. The colour itself indication that the product is asbestos free. CSGold meets the following physical and thermal property as per ASTMC522 Type II. • Excellent Resistance to damage, enhancing the life of the system. • Consistent Thermal Performance to 1700°F. • Structural Strength protects against damage to lagging. CSGold is manufactured in 12’’ x 36’’ (305 mm x 914 mm) sheets, flat or 3-V scored. 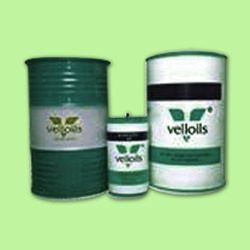 Thicknesses range from 1’’ (25 mm) through 4’’ (100 mm). When exceptional strength and durability are required along with low thermal conductivity, Our Calcium Silicate Products are the clear answer. Available in large selection of sizes and shapes, calcium silicate can fit many applications. 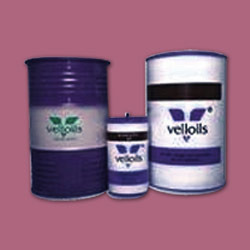 Pipe insulation products are inhibits corrosion to outside surfaces of pipe and equipments. Applications: Include curved vessels and large diameter pipes, Fire proofing of Structural steel, As a refractory backer in Industrial Furnaces, Boilers and Kilns. Calcium Silicate Powder is largely used in Power Generation Industry. Small sizes in block shapes are also used in interior design and noise and temperature insulation need in commercial applications. 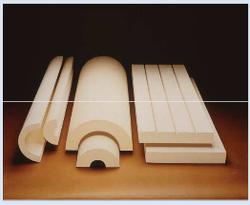 Calcium Silicate Blocks/Pipe Insulations is a pre-formed, high temperature, abuse-resistant pipe and block insulation with exceptional structural strength, composed of hydrous calcium silicate for use on systems operating up to 1200°F (650°C). It is inorganic, non-combustible, Asbestos Free and meets or exceeds the physical and thermal property requirements of ASTM C533, Type 1. Integral to ED500-CSe Gold is a distinctive formula and process that inhibits corrosion to outside surfaces of pipe and equipment. ED500-CSe pipe insulation is 36’’ (914 mm) in length, and is available in thicknesses from 1’’ to 6’’ (25 mm to 150 mm) in 1⁄2’’ (15 mm) increments. Thick wall material is furnished in double layers. ED500-CSe flat block insulation is 12’’ (305 mm) wide and 36’’ (914 mm) in length, and is available in thicknesses from 1’’ to 4’’ (25 mm to 100 mm) in 1⁄2‘‘ (15 mm) increments. Non-standard widths of 18’’, 24’’ and 36’’ (457 mm, 610 mm and 914 mm) are available on a made-to-order basis. Inquire for price and availability.